I first met Jason at an iGaming conference in London in February 2016. He was there with Naomi and a bunch of presenters promoting SmartLive Casino. I didn’t know then that I’d be interviewing him a few months later. 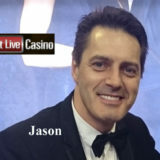 He’s a good looking chap and a nice fellow to boot and if you go to the Smartlive casino you’ll see how genuine he comes across. He’s also up for a laugh so most of the time you’ll see him having fun while he’s dealing at the tables. If you’re interested to know more about Jason then just google his name. You’ll find that he’s appeared in a number of TV commercials and presented and hosted a whole range of things. So kicking the interview off………………. The opportunity to work in Live TV. I had been presenting for many years , no experience of dealing. Friendly, informative, presentable and Knowledgeable of the games. Arrive at the studio 30 mins before live on air. 3- 4 hrs in 30 minute sessions. 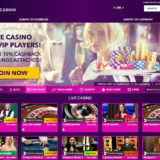 You learn how to deal, shuffle cards, spin the ball, and general knowledge of casino games. Amina Akram, who works at Smartlive Gaming and has been a presenter. There are recordings of her on YouTube. Learning to deal is different for everyone. You have to be proficient in the games before you are allowed to deal at the tables. Learning how to deal, shuffle cards, spin the ball, and general knowledge of casino games and website. 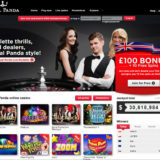 Mostly Blackjack and roulette , we are encouraged to learn other games on the website. Yes , the UK Gambling Commission. I believe a report is completed every day by the producers. It’s vital to have a rap-pour and make connections to players. I believe it helps to encourage them back. General questions which include, Hi welcome to the table how are you today? We have to avoid talking about any subject which could put the company in question and rules set by Ofcom. On Blackjack we have the software instructing us what to do. On roulette we have the live feed on a monitor showing the clock and players involved in each game. What’s the best thing about working for Smartlive? Working inside a friendly fun environment. Doing Auld Lang Syne on New Years Eve … great fun. They think it’s good with great flexibility. Elvis Presley, Stephen Fry, Gandhi, Richard Burton, Sophia Loren, Billy Connolly, Mohammed Ali. … I think they would all have some incredible things to say with great stories. The Maldives, I went there on my honeymoon. I have a Cockapoo called Betsy. All music has its place at different times. Stereophonics. It was a fantastic gig. The ability to heal anyone. I watch all sports and play a little football. 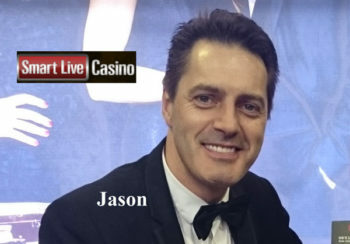 Thank you very much for your time Jason. If you’re interested in seeing and talking to Jason then he’s a regular presenter at the Smartlive Casino. He works on the Smart live dedicated tables that are hosted out of the offices in London. 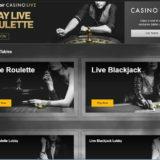 You can read more in my review of Smartlive casino or just click here to be taken directly to the casino.